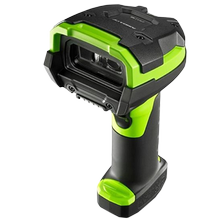 Easy, Rugged, Secure and Proven a thousand times! Within the scope of the EU Directive 2008/43/EC and 2012/4/EU, all companies handling explosives are obliged to ensure complete traceability of stored and used explosives since the 5th of April 2015. 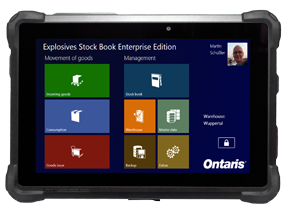 With the Ontaris explosives stock book you meet the traceability of explosives in accordance with the EU directive and benefit from the convenience of an electronic stock book. The Ontaris Explosives Stock Book was developed based on practical requirements of reputable companies. Therefore in close cooperation with these companies a product was developed, which can be operated with your fingers – without a mouse and keyboard. The handy devices consist of a robust 9 “tablet computer (protection class IP65) and a small Bluetooth scanner (protection class IP64). For producers, distributors, users, small consumers and powder distributors. The “Ontaris Explosives Stock Book” is the solution for quarries, mines and seismographers and demolition blasting engineers. It’s the solution for all those working with industrial explosives. The “Ontaris Explosives Stock Book Distributor” is designed for distributors and manufacturers of industrial explosives. It includes both the trade, the formation and production of new goods, as well as the warehouse administration with the development of new packaging and goods issue with XML file. The „Stock Book Smokeless- & Blackpowder“ is the right solution for distributors selling black powder or NC and also have to create new packaging and want to optionally generate an XML file for a delivery.